The first 100 per cent electric Nissan Leaf will hit Sri Lankan roads promoting the green concept and ensuring significant fuel savings. EV Lanka (Pvt) Ltd is the direct importer of these vehicles to Sri Lanka and it has already brought down five Nissan Leaf cars as an initial step towards popularising the electric models in the country, director of the company B. Premanand told the Businss Times. He noted that the electricity in houses could be used to charge the car battery and it will take 15 minutes for a full charge. The electricity bill will be around Rs. 350 (per charge) and it is very cheap compared to the price of petrol or diesel, he added. The cost per kilometre will be around Rs. 2.00. “The price of Nissan Leaf ranges from Rs.4.2 million and upwards,” he added. “The regular maintenance schedule on this is almost nothing,” he said. 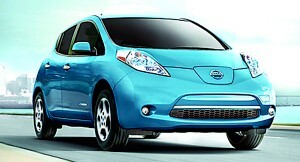 The Nissan Leaf is an all-electric car that was recognised as the 2011 World Car of the Year. The car is emblematic of the “no gas, no tailpipe” zero-emission era. The Nissan Leaf is a medium-size hatchback with cargo space and seating for five adults. It has a range of 160 kilometres on one full charge, he revealed. The Nissan Leaf also includes six air bags, four wheel anti-lock braking system, vehicle dynamic control and a traction control system. Because there’s no traditional engine, the Nissan Leaf is ultra-quiet, and for safety reasons, a sound had to be added so pedestrians could hear the car coming, he said. Powered by a lithiumion battery, the Nissan Leaf generates 107 horsepower. French carmaker Renault and its Japanese partner Nissan were instrumental in introducing Nissan Leaf. The United States is the top market for the Leaf, which is the world’s best-selling electric car.